The 2013 MINI has been spotted testing in the city and will spawn 10 different variants based on its next generation model. The new MINI Cooper has just been captured by our intrepid spy photographers. 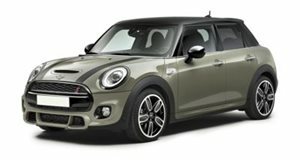 Slated for release in 2012 as a 2013 model, the Cooper will be based on the new UKL1 platform with up to ten different variants. The next generation MINI Cooper will be pretty busy, that&apos;s for sure. The flexible platform will be shared with all future small BMW models and feature both front-wheel-drive and all-wheel-drive configurations. In addition to the previously mentioned 10 variants, there will even be a smaller Rocketman version and a larger version said to be a van. According to our spy photographers and their sources, these prototypes seen in the photos are wearing the dashboard from the last generation BMW 1-Series. The new 2013 MINI will get the usual MINI center mounted dials in the center. This will also mark the first time that we will see a 3-cylinder engine in one of these MINIs, along the usual 4-cylinder lineup. The 3-cylinder has already been equipped on the BMW 3-Series, known as the 316i.